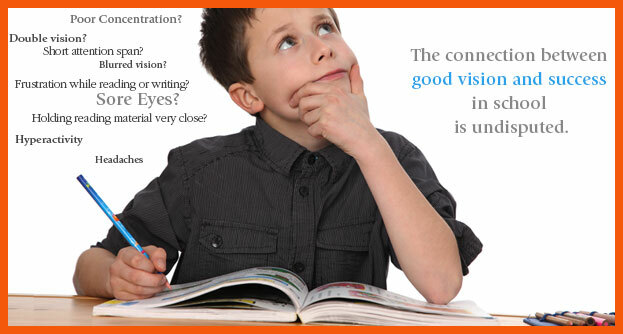 The connection between good vision and success in school is undisputed. Experts say that about 80 percent of what a student learns in school is information that is presented visually. We live in a visual world. So good vision is essential for a student of any age to reach his full potential and find success in the school setting. If your child is not succeeding in school, ruling out vision problems should be one of your first steps. Our eye doctors in The Woodlands, TX have the skills and expertise to identify if a vision problem is interfering with your child’s ability to access information and participate fully in school and in after-school activities. Your child may be nearsighted (can’t see far away objects like a blackboard), farsighted (can see objects that are close such as reading a book) and have an astigmatism (a blurring caused by the eyes inability to focus light appropriately). Having your student’s eyes checked by our optometrists at The Woodlands, TX is fast, easy and can relieve a lot of worry and guess work as you help to have him succeed in school. 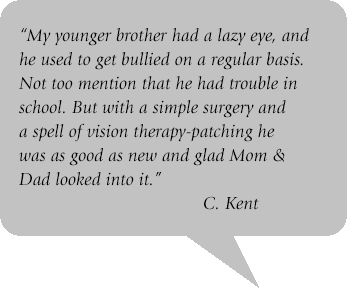 Vision plays a crucial role throughout childhood and beyond. Yet many parents don't understand how vision helps their children develop appropriately. Early professional eye care for children is highly recommended – even before kids start school. Watch this short video to see why. An individualized program of eye exercises and other methods can treat non-refractive vision problems such as eye alignment and lazy eye. How often should your child's eyes be examined? What's the difference between a school vision screening and a comprehensive eye exam? and more. Knowing the expected milestones of your baby's vision development during their first year of life can ensure your child is seeing properly and enjoying their world to the fullest. Contact lenses offer advantages in the areas of sports and self-esteem. But when is your child old enough for contacts? The first step is to make sure your child has 20/20 eyesight. But there are other, less obvious learning-related vision issues you should know about as well. Certain types of contact lenses and eyeglasses may play a role in slowing the progression of myopia, or nearsightedness.